Happy Monday! Do you guys like having the opportunity to win things here every Monday? is giving away ANY STENCIL on their site to one of you my sweet savannah readers! 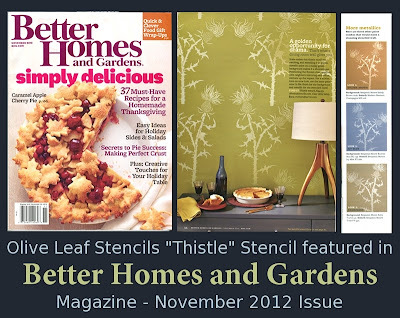 Olive Leaf stencils was featured in one of my favorite magazines~Better Homes And Gardens! Now, here is your chance to win one of these fabulous stencils! Go to Olive Leaf Stencils and pick your favorite. Leave me a comment telling me which one it is. I will pick a random winner and announce back here on Friday! Again, be sure to leave your email address so I can contact you if you win. You do not need a blog to enter. I love the Damask no. 1 ! They are all gorgeous!! The Art Deco Flora stencil is my favorite, but they're all beautiful. I'd use them to stencil my sliding closet doors. Definitely the Damask no. 1 for sure! I would love to win! Damask no 1 pretty please!!! The are all so unique and wonderful but The Chrysanthemum no 2 version 2 is my absolute favorite! I love the jellyfish one, but the preston pattern is totally calling my name! Great giveaway! Lovin on the polka dots!! I choose Linden Tree. They're all so beautiful it's hard to choose just one! Thank you for the opportunity! Oh my, how can I choose just one? They have so many beautiful designs! I would choose Chrysanthemum stencil no.2 to use in my daughters room. I love the Preston pattern! Tough to choose from though - they are all so cool! LOVE the nautical chain for my dining room... and many more for all over my home. I would love to do a polka dot ceiling in my daughter's room! Inatagram number six or the nautical chain - cant choose just one! I love the Geometric pattern #1. So fun. Thanks! Great giveaway!! I have been dying to try one of their stencils and love Fan Flowers!! What a fun giveaway! I love the Mod Pattern Stencil! I want to apply the Blossoming Tree stencil in my office !!! Love it !! Compass Rose Pattern is my favorite. But, they are all awesome. Love the chrysanthemum or ikat #2! Would love this for the foyer in our new home!! I love the stencil called Ikat pattern #2!!! If I win, I might have to rethink my nursery design to use this amazing stencil! I love the Geometric No 1 Pattern. Just lovely. My fav would have to be the Mod Pattern Stencil. I'm from Scotland so I love the Thistle stencils. WOW! That ART NOUVEAU TREE PATTERN STENCIL is amazing! The jellyfish!!!! Never would have thought that but it's FANTASTIC!! These are just beautiful. Love the WILLIAM MORRIS ACANTHUS SILK STENCIL. the nautical is adorable (loved the yellow/white sample)!! Hi - I'm a new blogger - www.purplemartinvintage.com. I love the 10 songbirds stencil. My tired dining room would look divine with this pattern gracing the walls! Thanks for the chance! Loving Ikat No. 2 and Striped Tulip (Large). Awesome giveaway! I adore the polka dot stencil! Would love to use it in my daughters' room! What a beautiful website - loving so many but I'm liking the Wild Rose Vine, thinking that would be nice for a accent wall in a half bath. Thanks for the chance at this fab giveaway! Love all the stencils, but the Preston pattern is outstanding! We are renovating a big house on a very tight budget and some pattern would make a huge difference. I like chrysanthemum no 2, preston pattern, geometric pattern no 1, and woven pattern repeating. Too many beautiful choices! I love the arrows stencil! What great stencils! I think I may be in love with the tree designs - what a hard choice. Love Noelle's Pattern Repeating Stencil but all of them are so great! I LOVE the Chyrsanthemum 2 stencil. I know I spelled it wrong, but I am dying to do this in my daughter's room! i love the pin cushion protea. The graphic feels fresh and airy. Beautiful! I love and actually just today purchased the "Art Nouveau Tree Pattern Stencil", and if that goes well, I'm hoping to get "Chrysanthemum No. 1 Stencil" for another room. Love them! I love the pin cushion protea stencil. the graphic is feels fresh and airy. I LOVE these stencils! They are all so lovely it is so hard to decide! I love the Fan Flowers Art Deco Stencil! Thanks for a great giveaway! Love so many of them, but I think my favorite is the Ikat design. They are all so pretty. Love them all so much, but especially love the Ikat design. So pretty! Ikat Pattern No. 5 is beautiful! in my foyer! So modern and unique...love them. I'm loving the Silver Birches stencil! 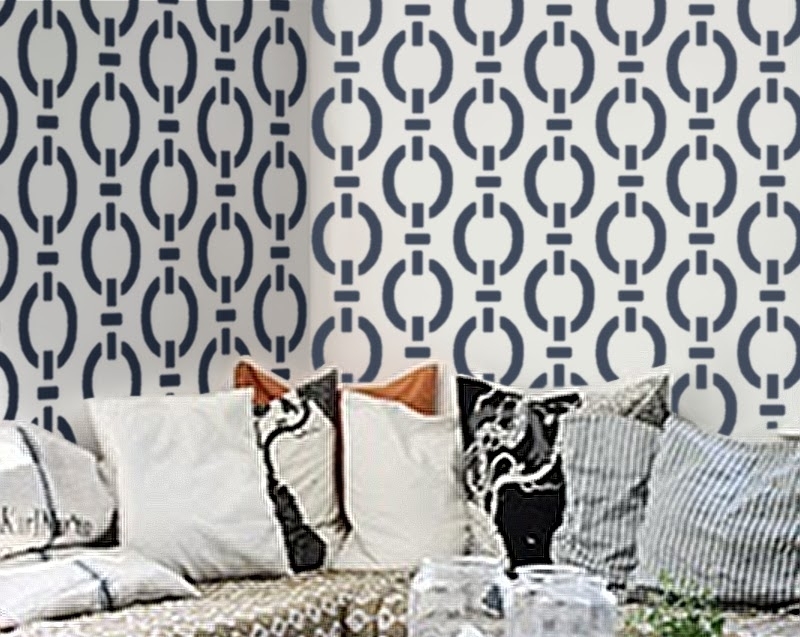 There is a wallpaper similar to it that I have been crushing on, but the stencil would definitely be a better alternative! Thanks for the giveaway opportunity! I LOVE the nautical chain for my breakfast nook! 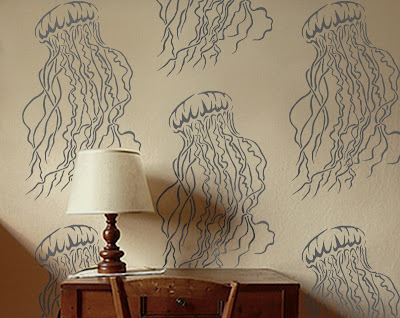 love the jellyfish, perfect for my beach house. Thanks for the chance to win. I love the Ikat Pattern #2 stencil. 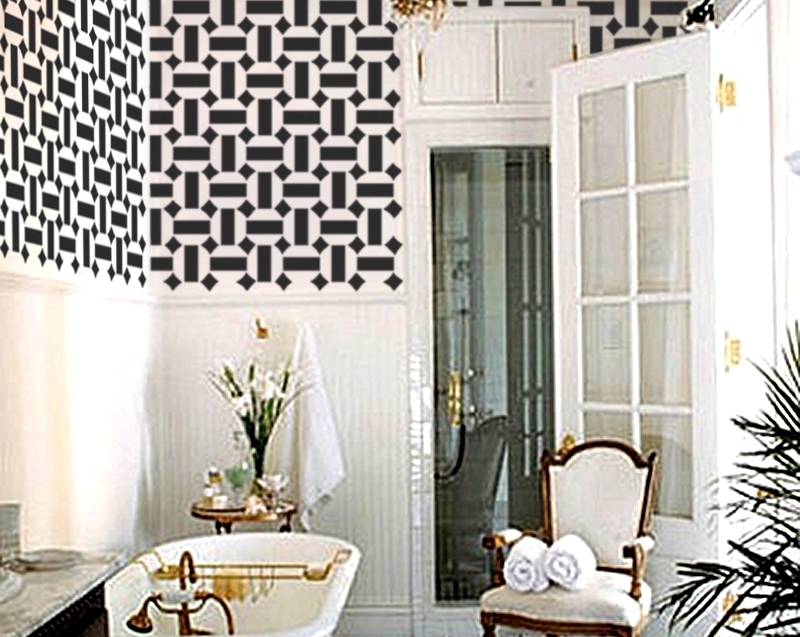 I can see this pattern in my entry way or maybe the guest bath. Thank you for the opportunity. Oh my gosh - I love the Ikat pattern #2! I guess I am not alone! I could see this in multiple places in my home, but would especially love it in the bathroom! Thanks for the giveaway! I love the Silver Birches stencil. It's really beautiful. So many to choose from that are wonderful. I really like the Ikat Pattern no. 2. I love the Skeleton Key and Olive Tree stencils. It's soooo hard to choose...but I love the Geometric Pattern No. 1. If I had a good space in my baby boy's rustic nursery the Compass Rose Stencil would be and awesome addition! My eye is always, always drawn to damask, but they are all gorgeous! Thanks! This will surely look lovely in my dining room. The classic polka dot....who doesnt love polka dots!!?? It is so hard to get perfect circles. The jellyfish is a close second...even though I got stung by two last summer! Yikes! I really liked Geometric Pattern no. 1. Damask No. 1 Wall Stencil It is so classic and beautiful! I love the blossoming tree! I've been wanting to do something like that in my girl's rooms. I also love the nautical chain, jellyfish, acanthus silk......I love so many of them! I love the chain link and also Geometric Pattern no. 1! So hard to choose! I'm torn between Noelle's Pattern and those gorgeous mums. I really want to try a polka dot stencils in my entry. Yay! I luv anything to do with birds but find the hummingbird or song bird stencils calling me! Wall stencil art here I come! Cheers and thanks for the chance. I would definitely choose the damask no 1 stencil! I LOVE the skeleton key stencil! I like the damask number 1. I have been trying to convince my husband forever that a damask stenciled wall behind our bed is a necessity! Love the damask number one! GEOMETRIC PATTERN NO. 1 REPEATING STENCIL is my favorite, then again all are beautiful!! I've been looking for a damask stencil for my dining room and I think Damask no. 1 will do the trick. Beautiful! I love the Ikat No. 1 stencil! It is lovely! the jellyfish needs to be in my mermaid/beachy bedroom...OMG. 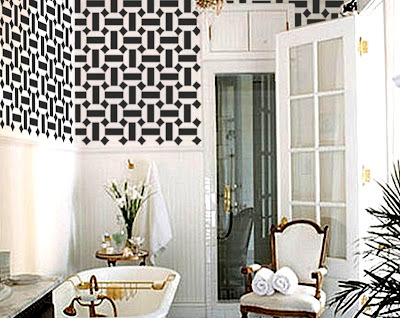 love moroccan tile#2 or ikat #2 - need for bathroom makeover! just found your lovely blog through jones design co! i am in love with the skeleton key stencil! the dogwood is beautiful; thanks for the giveaway! I was clicking around thinking nah, nah, nah. And then: holy cow she has ARROWS! I love the skeleton key stencil. But would take any of them. BEAUTIFUL! Okay No. 2 is my favorite! I would love to ushers it in my bathroom! Ikat No. 2 is my favorite! I love Ikat pattern no. 1!! There's soo many neat ones though! Wow, I love so many! I settled on the Mod Pattern Stencil as my favorite. 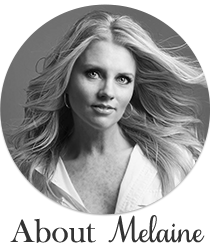 :) Found your blog through Jones Design Company and love it! Thank you! We are becoming first-time homeowners next month and I can hardly wait to decorate--these stencils are such a great idea! Thanks for doing this giveaway, as well as sharing all your wonderful creative thoughts!